My name is Robyn and I currently live on the outskirts of Sydney Australia with my husband and son, our 2 dogs and 1 kitty cat. I’ve been sewing since I was young (I’d say about 10 years or younger – don’t know exactly). I loved going through my Mum’s big suitcase full of fabrics and remember constantly asking her which ones I could use. I guess that was the start of my fabric and sewing life long, love affair. My Mum and my Grandmothers taught me how to sew, embroider, crochet and knit (although knitting is not my thing – and I really admire those of you who do it). In school I loved sewing and art and did well at both, although in life, my creative energies seemed to have always been in the sewing direction. I love hand embroidery, my sewing machine and making quilts. I really enjoy scrappy quilts as they always feel so warm and friendly to me, plus little scrappy pieces of fabric remind me of people, places etc. My working life has centred mainly around banking and finance (book keeping), with a 20 year stint so far in co-Managing a small business with my husband. I enjoy what I do. At one point, work took me in the direction of ‘lacing and framing’ embroideries and tapestries. This included stitching cross stitch kits sometimes too. This job was a favourite and a great experience. I have never ventured into ‘sewing and quilting’ for work, but it has been my passion, hobby and interest for many years now. In the early 2000’s, I had a hankering to meet with other quilters in my area to get together and sew regularly, but I couldn’t find any groups at all that I could attend, due to my work commitments. I was looking for an old fashioned approach of quilting together, say once a month. After much thought, consideration and a big dose of ‘being brave’ medicine, I decided to host a ‘Friendship quilting / sewing group’ in my own home. We have been meeting for years now and while some people have come and gone, our group is still going strong. Presently, there are only 3 of us who are regulars with a few stragglers coming when they can. It is wonderful to experience this and share with my sewing friends. We laugh, chat, eat and yes we do sew! We also try to go away once a year for a Girl’s sewing weekend… Woohoo!! What fun! Through this wonderful group, came the need to be doing more for others. After much searching, I happened upon a missionary group called “Heart of Hope” who help children in dire need of life saving surgery, who all share the common deadly affliction of heart disease. I wondered if making quilts for these children was a possibility or even if it would make any difference to them at all. I contacted ‘Heart of Hope’ and.. Wow!! The idea was gratefully and graciously accepted and this idea became Quilts 4 Hearts charity. Quilts 4 Hearts charity has now been making quilts for children since 2004. I don’t know exactly how many people have made quilts (or blocks for quilts) to date, but there have been many and for this I am so thankful. There have been people who have offered donations of money to Heart of Hope to help these children and this has been done through Quilts 4 Hearts. I am so very thankful to have been and to continue being a part of this! We have been involved in giving Hope and the children love their quilts. We also send a teddy bear with each quilt. Most of these dear children have never seen a quilt or a teddy bear. In an effort to make Quilts 4 Hearts known and after trying different varying methods, I started a Quilts 4 Hearts blog in May 2008. We are slowly getting the word out (still refining and tweeking the blog) and making people aware that if they want to help…they can!! In fact, we’d love your help if you feel this is something you can be a part of. It doesn’t matter which part of the world you’re from. You can help by placing the Q4H logo on your own site… by making blocks or quilts, by donating teddy bears..or by making others aware who may like to help. We hope to keep on…giving Quilts, giving Hope…one block at a time… Check out the blog to find out more and thanks for looking!! Please email me for any questions at (daisyquilts at gmail dot com). A few years ago, I also ventured into the world of internet quilting!! Wow!! I discovered a big wide world of quilters out there, who despite, distance, illness and many other situations, cannot be stopped! We love getting together! I am privileged to have been a member of a few internet quilting groups and have participated in swaps, chat and so much encouragement. I have the quilts and blocks to show for it!! They are full of wonderful fabrics and memories. These are two quilts I made, Swap Puzzle and Scrapmania. I love the way we bloggy quilters and crafters share the best way we can over distance and continents…through cyberspace…and our mailboxes. Neither time, nor distance stops us. Having been involved (and still involved) in internet quilting groups, I was vaguely aware of the blogging world. The quilting blogging world. I became aware of a few quilt group members talking about blogs and so I thought I needed to check this out, also thinking that I would ‘look and leave’. Wow again!!! I couldn’t leave! I have been so pleasantly delighted at all the beautiful blogs of beautiful people out there, with more starting everyday. With this I discovered another new world of quilters and wonderful Friendships, so I was hooked! In November of 2007 and with much trepidation I started my own blog. I called it Daisy Quilts. After recently celebrating one year of blogging and my 1st giveaway, I have met so many more of these wonderful quilty/crafty people, even people in my own country who I would never have known otherwise. This year, a friend and I decided to start a delightful Hexagon quilt. This quilt was inspired by a picture from the Quilt Index and I decided to post about it on my blog. See quilt here. The response is and has been amazing. I didn’t realise that we quilters love little hexagons so much!!! Some people said that if we were starting this, they would love to do it with us. Wow again! As I had started and been involved with groups before, I started wondering about maybe doing a Hexagon Quilt-along and so posed the question. Again, resounding interest. So, on January 7th this year, The Great Hexagon Quilt-Along was born. At the time of writing, we now 40+ members! Some things have lives of their own. The Great Hexagon Quilt-Along group is not a ‘How to’ group but a ‘Come and quilt with us’ group . We quilt along together and share our pics and ideas and watch each other’s quilts growing. We are still only very new right now. The biggest part I hope for and see, are the Friendships and encouragement that people give and receive. If you love hexies, you are most welcome to call by and say hello, or simply ‘lurk’ and see what’s going on. I’ve been pretty excited about these two ideas, (Quilts 4 Hearts and The Great Hexagon Quilt-Along) so when Michele put in her newsletter about Guest Bloggers, I thought I’d like to share with you all a bit about what inspires me and a little of my story, plus the birth and reasons behind these two blogs. If you have read this far…thank you for doing so. 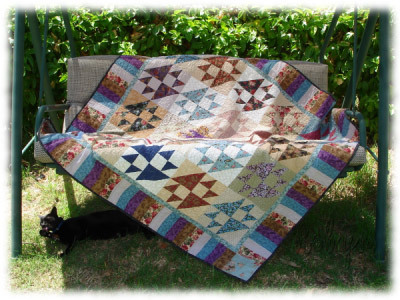 You are most welcome to stop by my blog at Daisy Quilts or to send an email to say hello. I would love to hear from You. I hope that my story (or part thereof) may somehow inspire you and / or encourage you. Welcome, Robin! What a wonderful story of your own journey into the amazing world of quilting, sharing, donating and blogging! It’s so much fun meeting new quilters online and sharing our lives and stories. Stop by my blog for a virtual cup of tea and check out my list of links to over 2,500 free quilt pattern sites that I love to share with quilters! Both community quilting and charitable quilting are important parts of my own life and I blessed to meet more and more women (and a few men!) who share this amazing creative outlet! 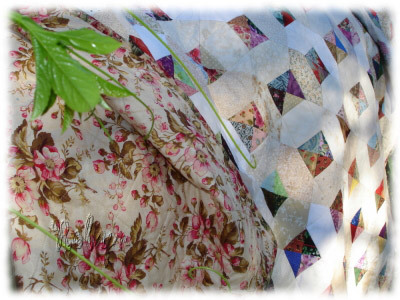 I’m a scrappy quilter, too and absolutely love your comment about how scrappy quilts are not only cheerful but filled with memories. That is so true! Hey Robyn! Love your guest spot! I remember those early chat days and all the swaps. Guess it’s good we’re scrappy quilters…that way, all the blocks work! Good to hear you’ve got a strong quilting group and a Mission project! 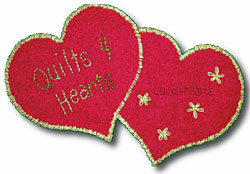 I like the name Quilts for Hearts. Thanks so much Michele and Pat!! .-= Robyn’s latest post: Handmade Christmas Ornament Swap 2009 =-.